Buy One Get One Free Storewide! 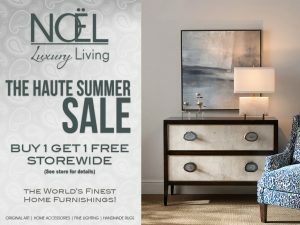 During the month of June in Houston the weather can be Hot but the savings right now at Noël Home are even Hotter! The Haute Summer Sale has arrived. Buy one item at retail price and get other item of equal or lesser value FREE! Visit the Noël Showroom today for the finest & largest in-stock collection of luxury home furnishings in Houston! Going On Now.